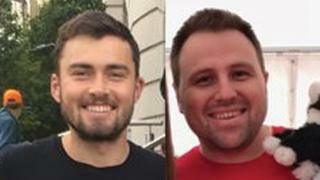 Two men who died after collapsing at the end of the Cardiff Half Marathon last year died from natural causes, a coroner's investigation has found. Ben McDonald, 25, from Cardiff, and Dean Fletcher, 32, from Exeter, went into cardiac arrest after crossing the finishing line within three minutes of each other in October 2018. They both died at the city's University Hospital of Wales. No inquest will take place, the coroner's office said. Mr McDonald worked at Cardiff International White Water centre. He ran the half marathon with his girlfriend Amy Stanton-Foo, his two brothers, a brother-in-law and two sisters-in-law. Speaking after his death Ms Stanton-Foo described him as a "happy, smiley, adventurous, loving person". Father-of-one and former Cardiff University student Mr Fletcher had been part of a 350-person team which was raising funds for neuroscience, mental health and cancer research at the institution. He was described as an "amazing husband and father".